Look at what I’m reading! I messaged my friend. 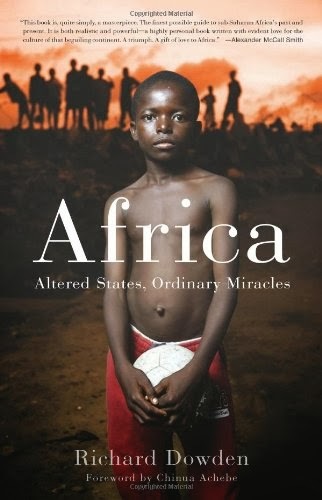 I included a photo of the cover of Richard Dowden’s “Africa: Altered States, Ordinary Miracles” for good measure. Oh look. An African kid without a shirt holding a dirty soccer ball. He retorted, unimpressed. In his message, I could pick up a tinge of frustration with the idea that I was reinforcing stereotypes of his continent. To be honest, I couldn’t blame him for that comment. The cover was the exact reason I hadn’t picked up the book over a year ago when I saw it on the bookshelf. (Everyone says that you shouldn’t judge a book by its cover, but everyone does it anyway.) I finally bought it because of the recommendation of a professor, and I found myself very surprised by its contents. It was deeply insightful, backed up by personal experiences of the author in Africa. Once I started it, I simply couldn’t put it down. Look. Chinua Acebe wrote the foreword. I mentioned after I remembered why I brought the book up at all: We had been deep in a discussion about African literature and Chinua Achebe. Wow. It must be good then. He responded. Then he dropped a bombshell question: Emily, how many of the books you have read for your blog about Africa are actually written by Africans? That question launched a discussion that lasted nearly two hours – long into the midnight hours on the African continent (his location at the time), for sure. It was a puzzling question with many more factors associated with it than first met the eye. In fact, I had read several books written by Africans for my blog. The problem was that almost all of these books were memoirs – not well-researched books about the economy, politics, energy resources, conflicts, etc. Based on what I had read (which had been highly influenced by a former professor who focused his research on the continent), there was definitely a lack in non-fiction literature about Africa by Africans. In our discussion, we jumped from topic to topic trying to determine the causes for this phenomenon. Three main ideas from this conversation struck a chord with me: (1) Africa attracts thrill-seeking westerners, looking for the exotic and the exciting – strikingly similar to the role it played during the colonial era (an idea I first read in Scroggins’ book about Sudan, Emma’s War). Subsequently, there is a very high supply of potential western journalists and authors. (2) Likewise, there is a very low supply of educated Africans willing to write such non-fiction literature. This is partially because the perceived gains (in a young African’s mind) from devoting one’s studies to science and technology is much higher than from devoting one’s studies to a subject like African history and cultural studies. The prime example of this is that my friend – despite his interest in other fields – is pursuing his doctorate in computational science. (3) Based on our observations, a “real” non-fiction book about Africa – a book by Africans about Africa – was far in coming. Many of the primary resources in non-fiction books about Africa are studies conducted by western aid organizations or research teams. Even if an African wanted to write about Africa, s/he would have to rely on sources generated by non-African individuals or groups. I share this example not to say that this book was not a worthwhile read about Africa – in fact, it is one of my favorite books I have read on Africa, thus far. The cultural insights of this book can only be shared by someone like Richard Dowden, who worked for over 30 years in Africa as a journalist. The structure of the book is interesting in that Dowden dedicates some chapters to broad topics and then delves into specific examples through chapters about individual countries and their unique challenges and conflicts. Despite the diversity of the African people (Dowden notes on page 9 that “Africa has more than 2000 languages and cultures and, despite the fact that we all share a single African woman as the mother of the human race, there is more human genetic diversity in Africa than in the rest of the human race combined.”), all African countries face one similar challenge: the fact that outside forces not only wrote their past histories, but are currently writing Africa’s present. In his book, Richard Dowden exposes the outside forces at play in Africa - criticizing the western aid industry, exposing the effects of western foreign investment in industries like oil, and discussing the true intentions of China on the continent. I was particularly interested by three assertions made by Dowden in criticizing the aid industry: the creation of a one-dimensional image of Africa for the aid industry’s own self-interest; the intervention of aid organizations often exacerbating problems in Africa by enabling wars and instability to continue; and the lack of effective measurements to determine the real needs of the African people. Dowden also discusses the effects of the foreign investments on the African continent, showing how Africa is easily malleable to outside forces besides aid. He notes that “In a state totally dependent on oil like Nigeria, the ruler derives his power from outsiders: the companies that extract oil and Western countries that buy it. Power oozes down from the ruler reducing the population to dependency.” (page 462) In this, he draws a direct cause-and-effect relationship from western foreign investment to autocratic rulers, who often override the will of the people. The book also dedicates an entire chapter to perhaps one of the hottest topics regarding Africa today: the Chinese. He states that “Whatever strategic and diplomatic advantage the Chinese state seeks in Africa, its most visible footprint is trade. Where the West sees Africa as the place to make poverty history, the Chinese see it as the place to make money.” (page 493) While this is perhaps a self-evident assertion (and can been seen as a stark juxtaposition to US foreign policy in many African countries), it is important to note that the result of the Chinese presence in Africa will be the continuation of the same: empowering a small number of elites to ruling the majority empowered by outside forces. I will end this post by stating a question – the one at the heart of the conversation with my friend, as well as the one at the core of this book: At what point are we helping Africa by devoting our time to study it, our aid money to help it, and our investments to bring it into a new stage of development? And at what point does our interference prohibit the African discourse and action from taking a shape of its own?